People should be able to obtain a straight, beautiful smile without feeling self-conscious of the treatment used to achieve it. At the office of Robert V. Kinoian, DMD, our Paramus dentist provides Invisalign® clear braces to adults seeking to align their teeth. This virtually invisible orthodontic system gently shifts teeth into improved positions while remaining undetected by others. Straight teeth not only enhance appearance, they ensure optimal dental function and oral health as well. Dr. Robert Kinoian always keeps his patients’ needs in mind, making sure they remain confident as they reach their dental goals. Invisalign clear aligners have many advantages when compared to traditional orthodontics. They are conveniently removable, allowing patients to take them out when eating and drinking. Patients also do not need to add steps to their dental care routine as you can simply remove the trays, brush and floss your teeth as you normally would, then reinsert them. Patients also do not have any dietary restrictions placed on them. Since patients can simply take out their aligners, there Is no risk of damaging the appliances. Even those crunchy and fibrous foods that dentists warn traditional orthodontic patients to avoid are available for Invisalign wearers. When receiving Invisalign clear braces at our Paramus dental practice, you undergo an initial free consultation with Dr. Kinoian. This examination is where our dentist analyzes your dental anatomy and determines the benefits you would obtain from Invisalign treatment. The clear aligners work well to resolve dental issues dealing with bite, crowding, and gaps between teeth. Once you have been cleared as a viable candidate to undergo treatment, you have impressions taken of your smile and sent to the Invisalign lab. The lab will send back your first set of trays, and our dentist will instruct you on how to properly use the appliances. Invisalign Teen is also available for our adolescent patients looking to straighten their teeth in an appealing manner. The clear braces come with indicators to show the patient how far along they should be during different periods of treatment. 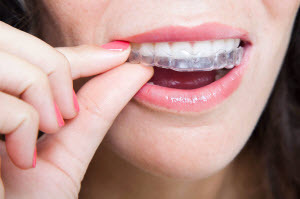 To be eligible for the Invisalign alignment method, you must have a matured jaw and the diligence to remember to continuously wear the clear trays. Invisalign works best for mild to moderate malocclusion, meaning patients with severe misalignment may not be a viable candidate for Invisalign treatment. If you are looking for a way to achieve a beautiful, healthy smile without detracting from your aesthetics, contact the office of Robert V. Kinoian, DMD. For more information about Invisalign clear braces, visit our Paramus dental practice today!